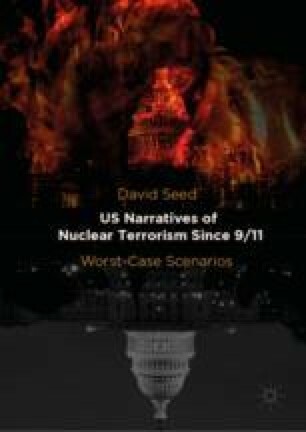 Taking bearings primarily from 9/11, this chapter examines instances of how nuclear conspiracies are investigated and forestalled. These usually centre around the theft and deployment of nuclear materials or devices. The narratives broadly follow a pattern from the thriller genre of alternating episodes from those conspiracies with those describing how the investigating agencies work. The latter often shed an ironic spotlight on how investigation is delayed by agency rivalry or, as happens in Mary Louise Kelly’s Anonymous Sources, by the “need to know” principle minimizing the flow of information. The conspiracies described are frequently domestic and the narratives reflect the complex legacy of the Cold War.